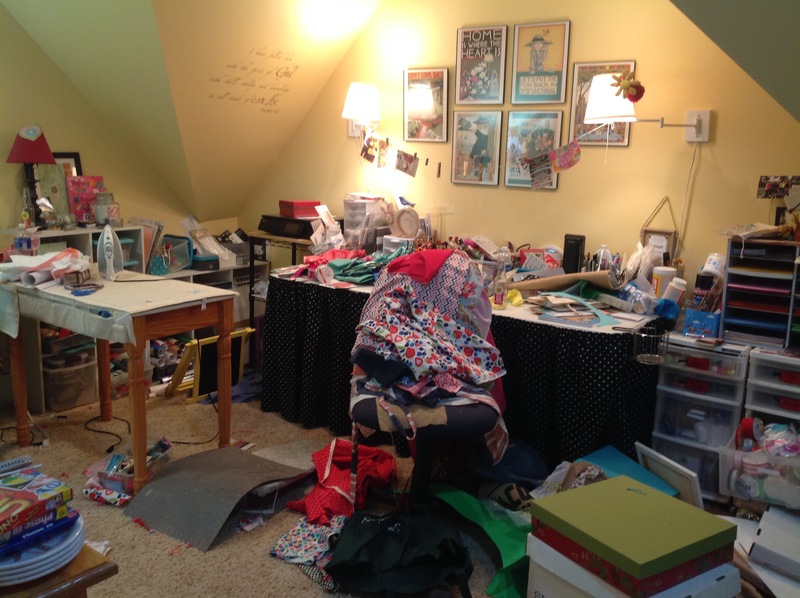 For the past couple of months my craftroom has looked like this…an absolute mess. How in the world does anyone get anything done in there? Each night I’d sort of straighten things up, make neat little piles and organize the projects. But then the next morning I’d get started and six hours later, it looks like this? 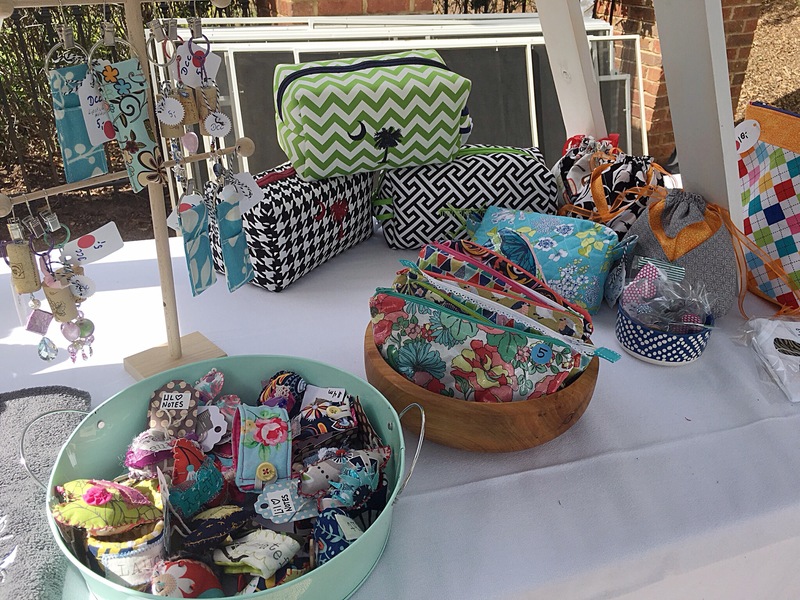 I was sewing all sorts of fun things to sell at this art fair. I sewed aprons, knitted wash cloths and burned hearts into spoons. With it being spring time, I was thinking bridal showers, Mothers Day and teacher appreciation gifts. I just think women like bags. Can you really have too many? I use a bag like the one on the left to carry my bible and sermon notebook to church or to hold all my stuff like books, craft supplies, and snacks when I travel. The bag in the middle is big and sturdy enough to hold a computer. I know lots of young moms carry these larger bags to hold the baby essentials. 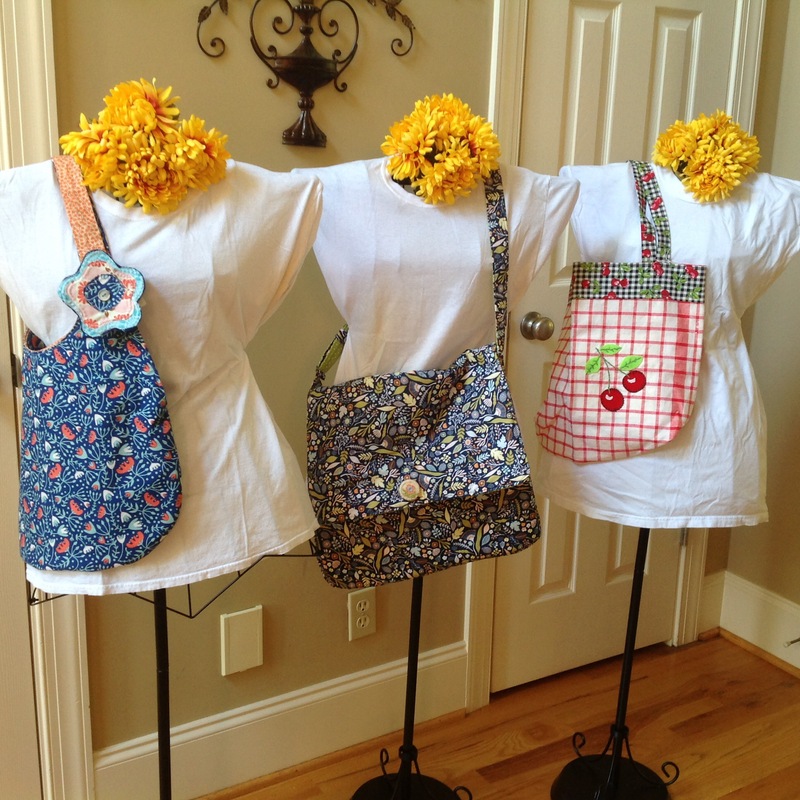 The cheery cherry bag is great for shopping or even to use as a pool bag. These little lovies are so sweet! 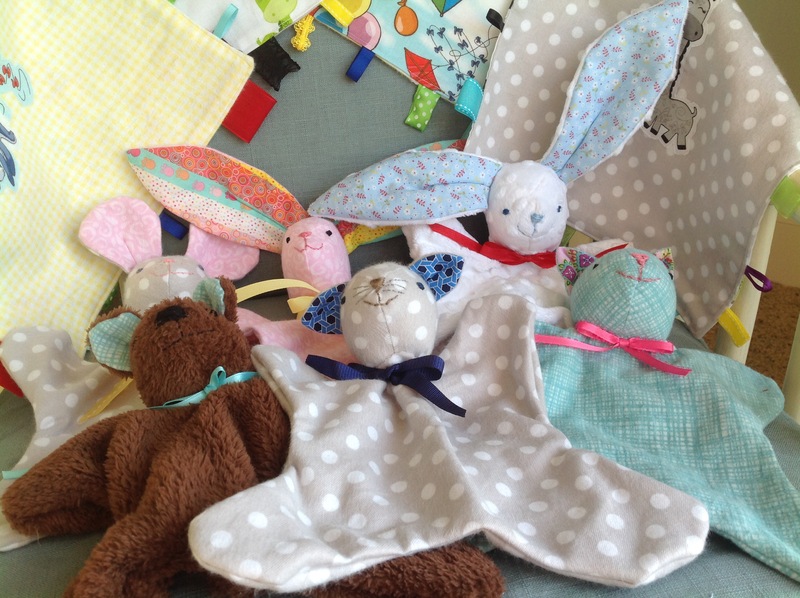 Each one is soft and easy for a young baby to hold and their hand stitched faces make me smile. Behind the lovies are taggi blankies with multiple different ribbon textures for baby to finger. 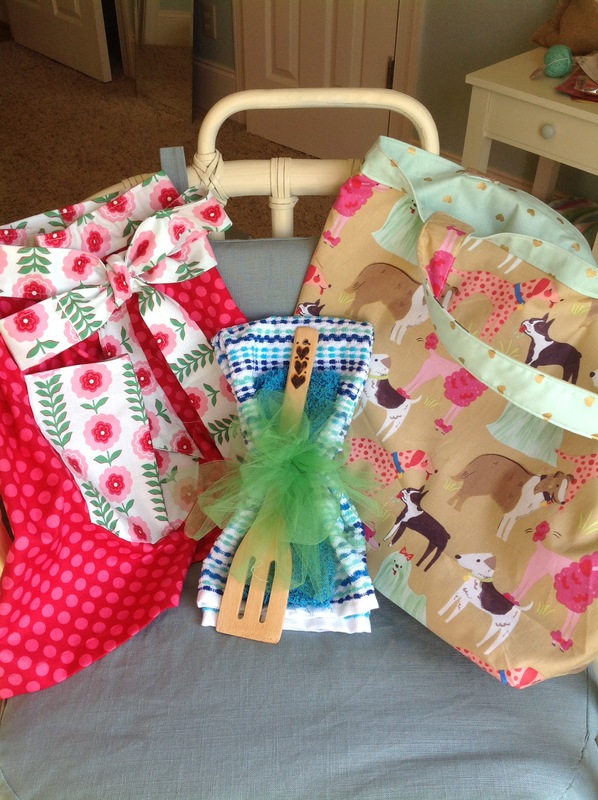 For all of those new babies, we had toys, burp cloths and bags. 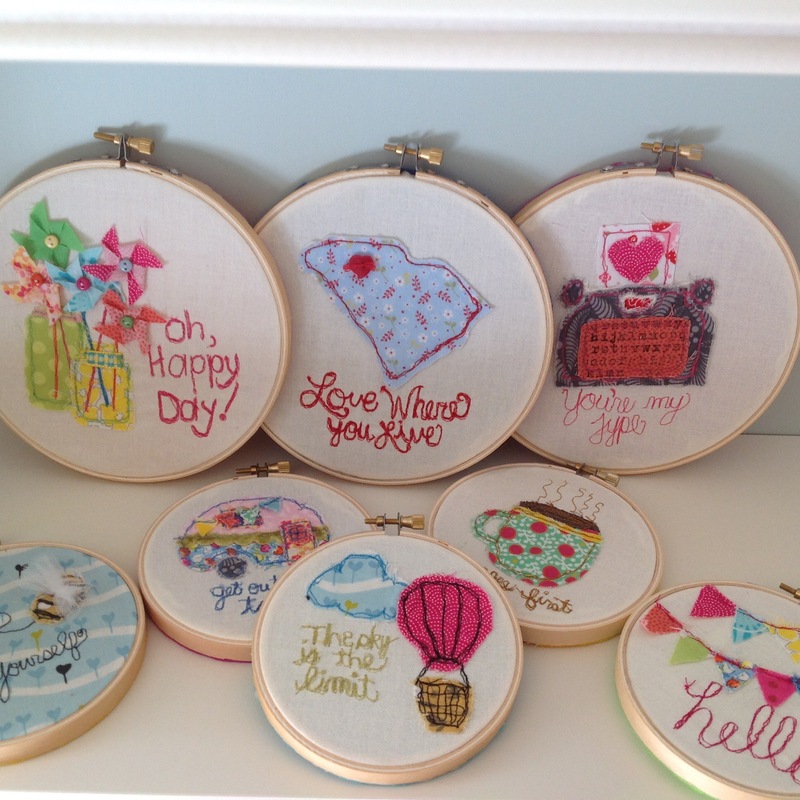 These embroidery hoops were some of my favorite things to make. There is something I love about using scraps of fabric, drawing out my designs and figuring out a new skill. These make me happy! The new college kids need something to decorate their dorm walls. Ok our inventory is ready, now it is time to figure out our set up. The last Craft fair (and my first) Dagmar, Debbie and I had six long tables to set our stuff out on, plenty of room for all,of our stuff. This time, Dagmar and I have to squeeze in a small 10×10 tent. We set the tent up in my driveway to do a practice run. We didn’t put everything out, but we put enough out to see how much room we had and the best way to display the items. Dagmar made this great ladder shelf for her scrubs, balms and lotions. 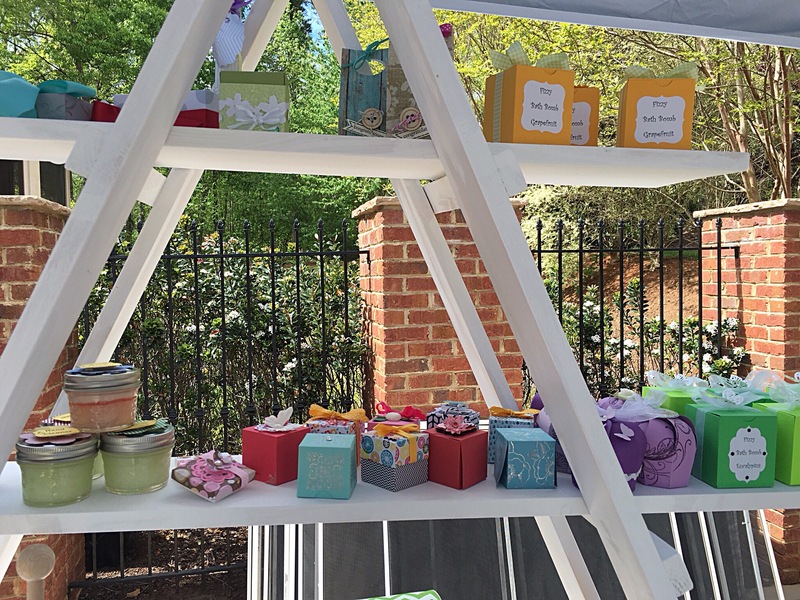 It was perfect for using the vertical space and displaying her pretty boxes. I found bowls to place the zippered makeup pouches, fabric cuffs and love notes in. Dagmar had a wooden tree to hang her key chains on…very clever that girl. 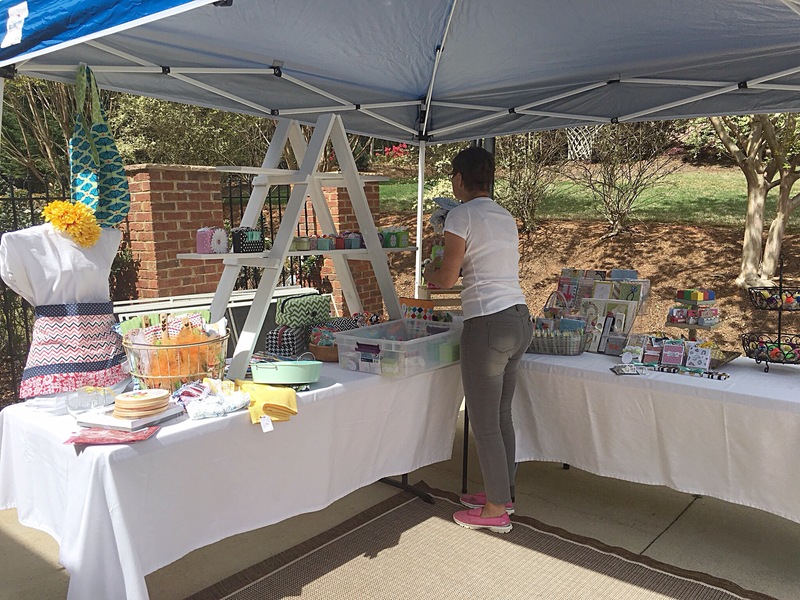 We were feeling good about our set up, so we packed up the cars with the tent, tables, and boxes of things to sell. Of course you never think you have enough, so old Mar stitched a few more lovies. The next morning came with a case of the jitters. The “quick” stop I made before going to the fair turned out to take longer than I expected, so that just added to my stress level. We hurriedly unloaded the cars, raised the tent, and set up shop. Did I tell you how freaked out I was with this whole thing? Oh my goodness! I tried so hard to be prepared and ready. Dagmar and I talked through all the details. But then the day comes and all this crazy doubt slams me! Looking around at all the other stalls, I immediately assumed we were out of our league. People were talking about other craft shows and how many they were doing that month. I saw professional pottery, metal works, wood crafts….like REAL ART! And I’m here with a few Suzi Homemaker aprons and bags. Luckily for me, there was a lady two stalls down selling cases of wine for the Humane Society. She was giving out tastings. Who cares that it was only 10:00 in the morning, I needed a little sip to calm my nerves. THEN, you know what happened? I made a sale! Woop Woop! As you can see, we hung a metal chain from one corner of the tent to the other. The bags were hung by shower curtain rings. The cheap plastic ones are easy to open and fit perfectly in the chain. 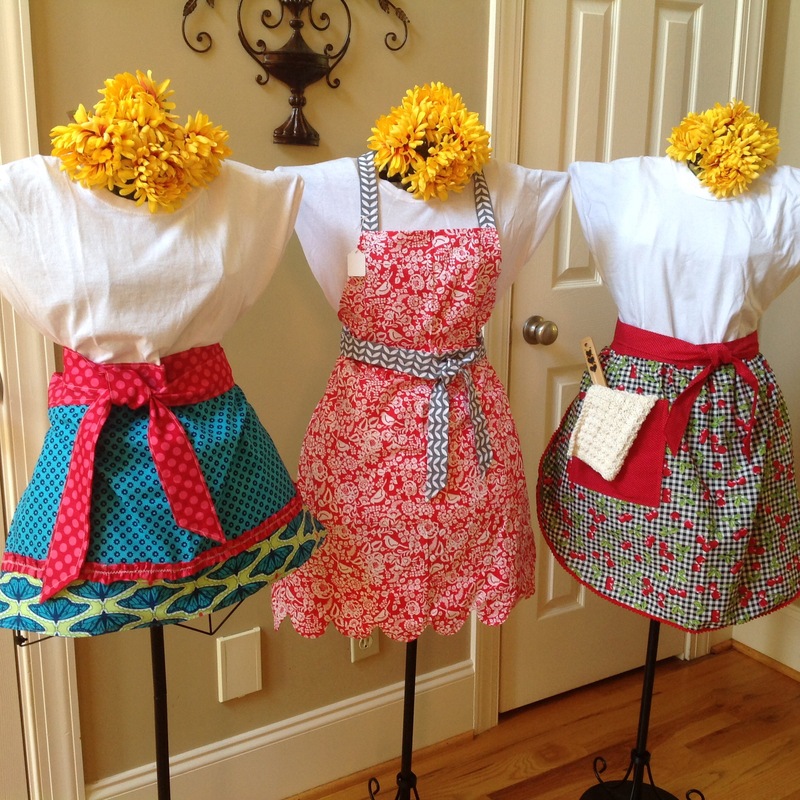 My aprons were hung on hangers and again onto the metal chain. Hanging the bigger items allowed the customer to easily browse through all the choices. Next time, I will have all of my hangers match, instead of just raiding closets in my house for stray ones. 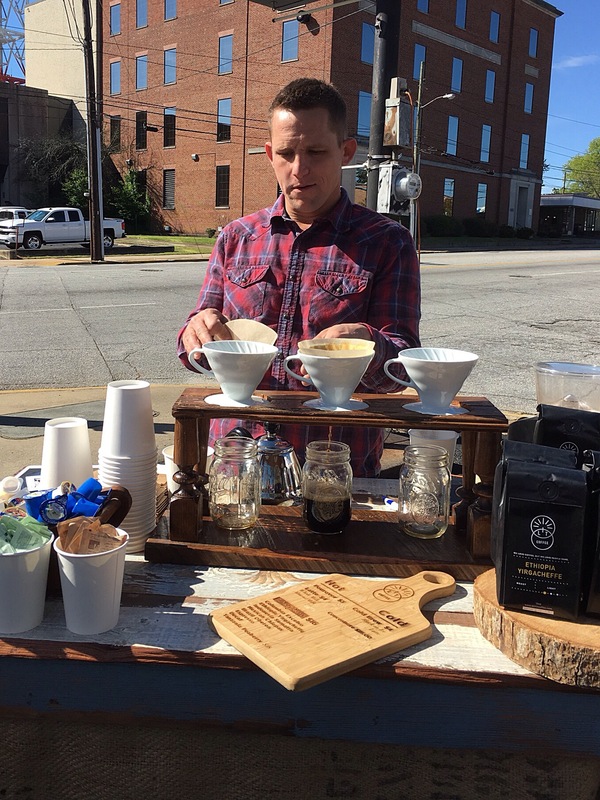 It was a breezy cool day, so I was very happy having this guy brewing hot coffee. He had a pretty interesting set up. Don’t you love the white cups on top which filtered down into the mason jars? It was delish! 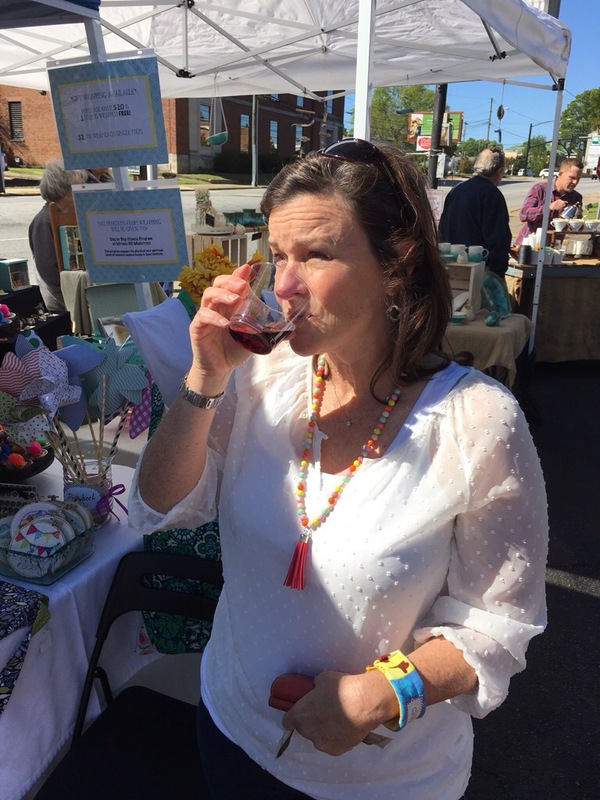 My cup of coffee and swig of wine gave me the courage to walk around and see what was going on in the other booths. One of the requirements of the art show is that everything had to be hand made, no manufactured stuff like Tuperware. The guy beside us had his photography blowing over into our booth with every brush of wind. (Bless his heart.) The lady on our other side made miniature mice with their miniature families in miniature homes reading miniature books. I love miniature things. Her work was really well done. 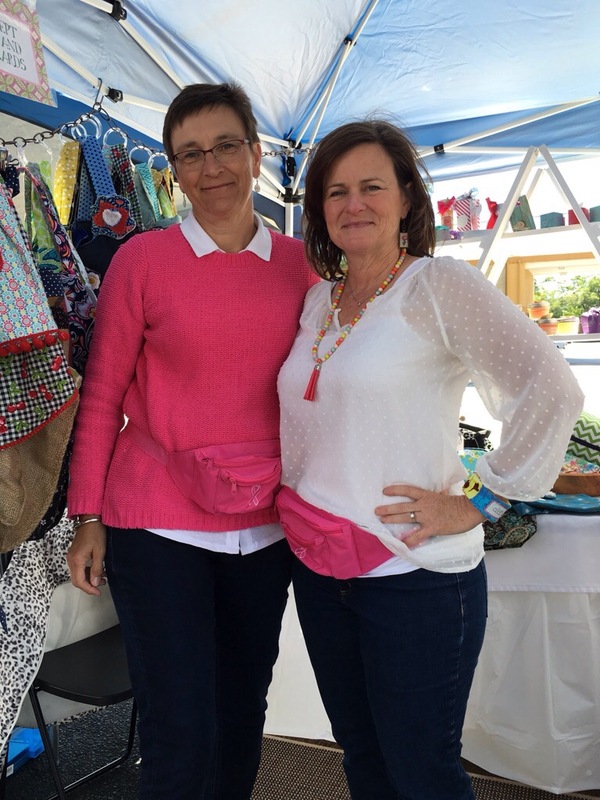 A mother-daughter artistic duo sold signature paintings, jewelry, and purses made from leather and fur. There were many jewelry booths, a few unique furniture shops, like this one selling mud room benches. I think that green one would look great in Mary Claire’s house. Every booth was different. Every artist had their own personal touch. Everyone was kind. 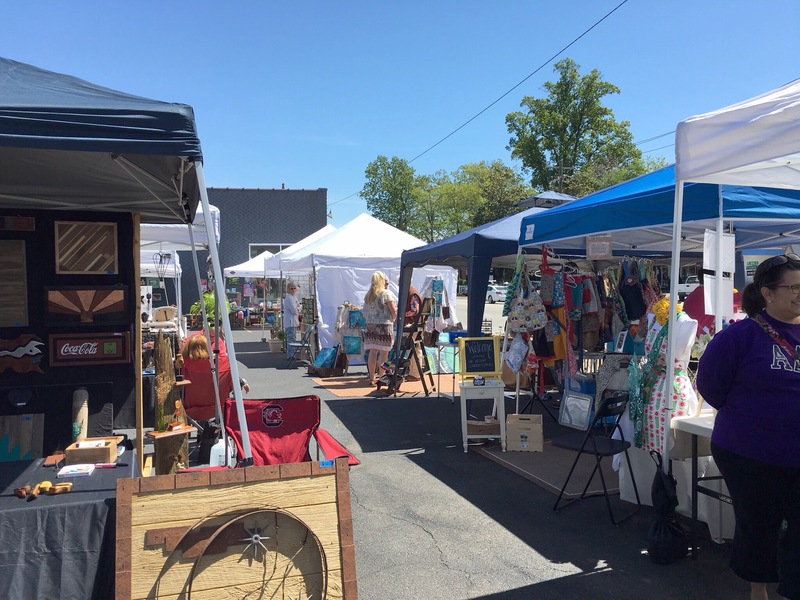 I was amazed at how Brandi, the owner of the Art Lounge, was able to get over 20 booths into her parking lot. Brandi and her team were incredibly helpful with unloading cars, setting up tents, offering pizza for lunch, checking in on us, and taking things down in the end. It made me so happy to see our friends who come out to support us. 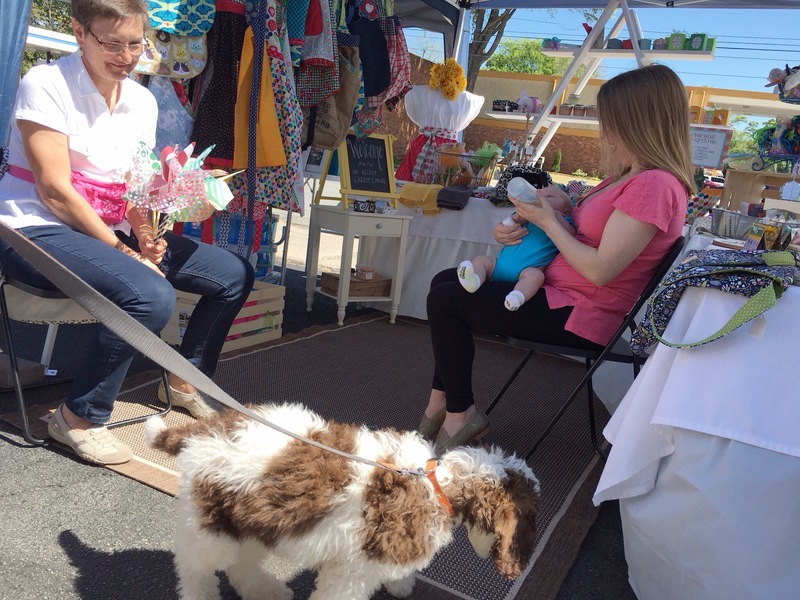 At one point in the day, I was having a nirvana moment…a sweet baby boy and his parents visited at the same time as a fluffy puppy in my crafty booth! Love! Well I have to say, it was one lonnng day. I wouldn’t have wanted to do it with anyone other than this amazing friend. I have lots of sweet cherished friends, but no one “gets” this whole need to craft, like Dagmar. At the end of the day, we packed up our things and went home. I unloaded my car and threw all the stuff into my craftroom and closed. the. door. 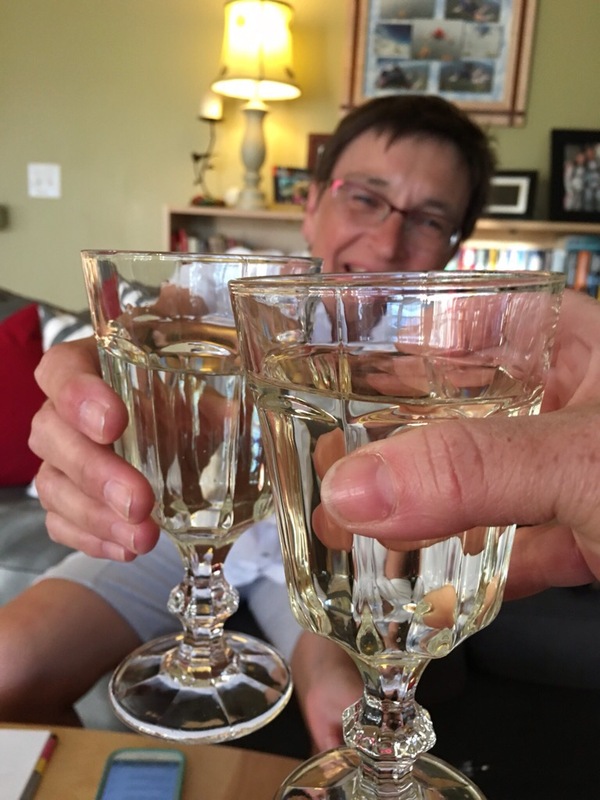 After getting into my comfy clothes, I went to Dagmar’s house to count up the earnings and discuss the day over a glass of Meade. I’m so very new to this craft fair thing, so I am no expert, but I think there are some things that are to be expected. For example, at one fair you can sell the heck out of paduzzles, then the next fair you sell none. 2. You must be prepared for the unexpected. 3. Unless you are willing to spend the big bucks on a booth rental in a big market, then you have to accept the smaller market for what it is. 4. There is no one reason why the crowd may be small. It could be the day, the time, the weather, the venue, the alignment of the stars. 5. Always remember why you do this. 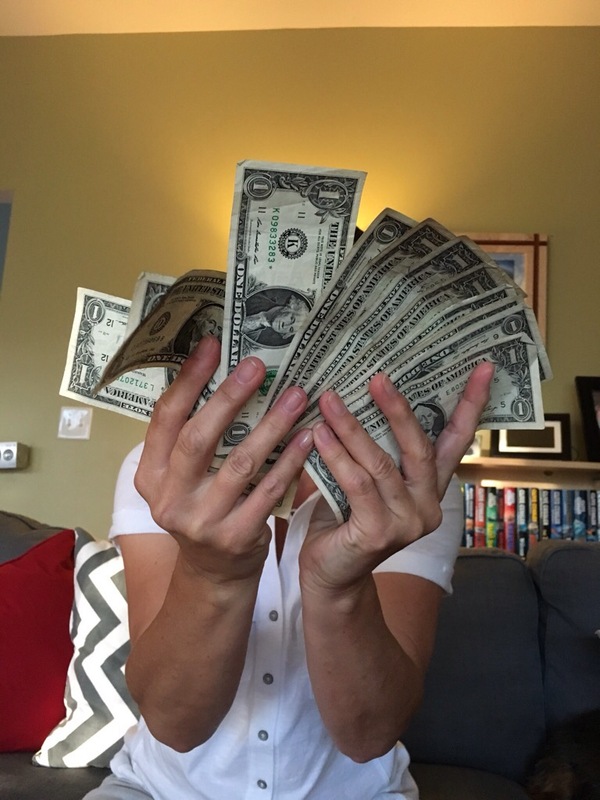 In the end, I made about $200. Did I make a profit? No Way! The time I spent bent over my sewing machine and the too many the trips I made to Joann’s Fabrics? Oh my. To make a profit is not why I do it. I have to create. Some of you have to research, some have to run, some have to stand up for the down trodden. I have to make. As I wrote about it here, God gave me this talent to use to glorify Him. It isn’t about me. Yes, I love to stroll the aisles of craft and fabric stores searching for a new idea, but I do it mostly so I can give to someone else. At the my first craft show, I was able to give a $250 check to a non-profit mission, English Crossing, which teaches the English language to adult immigrants, help them integrate into the community and share the gospel with them. 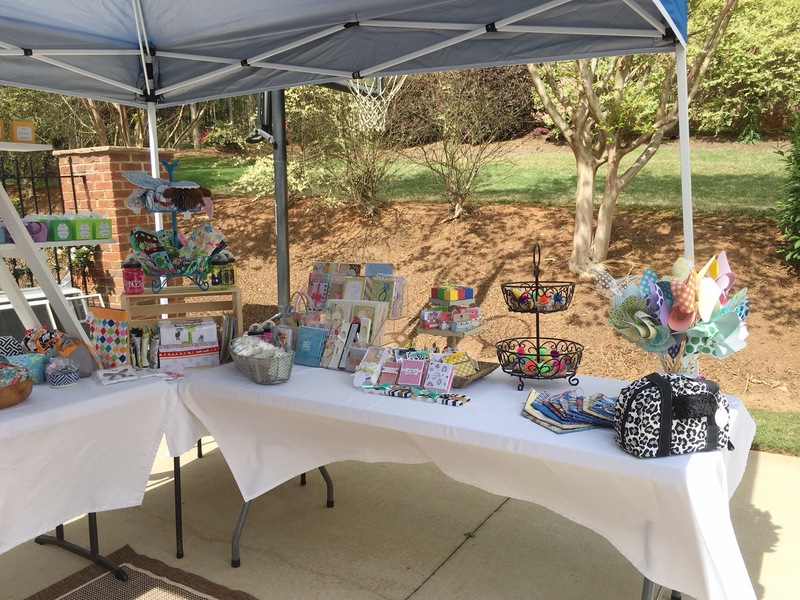 This time, I am giving the $200 I made from this craft fair to my friend Margo. She is the director, organizer, driver, counselor, doctor, funder, jazzercise leaders whoshows up twice a week at the local homeless shelter. I wrote about Margo here. She saw the health of the women at Miracle Hill as dismal at best. She knew through her medical degree that just walking can not only drop pounds, but it can stir up the good hormones and motivate those who are depressed. She loads her SUV up with women and she drives them to a nearby park . They begin each workout with prayer and devotions, then they walk or run for the next 45 minutes. On rainy days, Margo pops in an exercise video which she leads the ladies in getting their sweat on. Margo keeps a detailed chart of the women who choose to participate in the program, so that with each goal reached the ladies receive incentives. With her own money, Margo buys all the water bottles, drink powders, bus passes, Walmart gift cards and organizes the donations of athletic shoes. 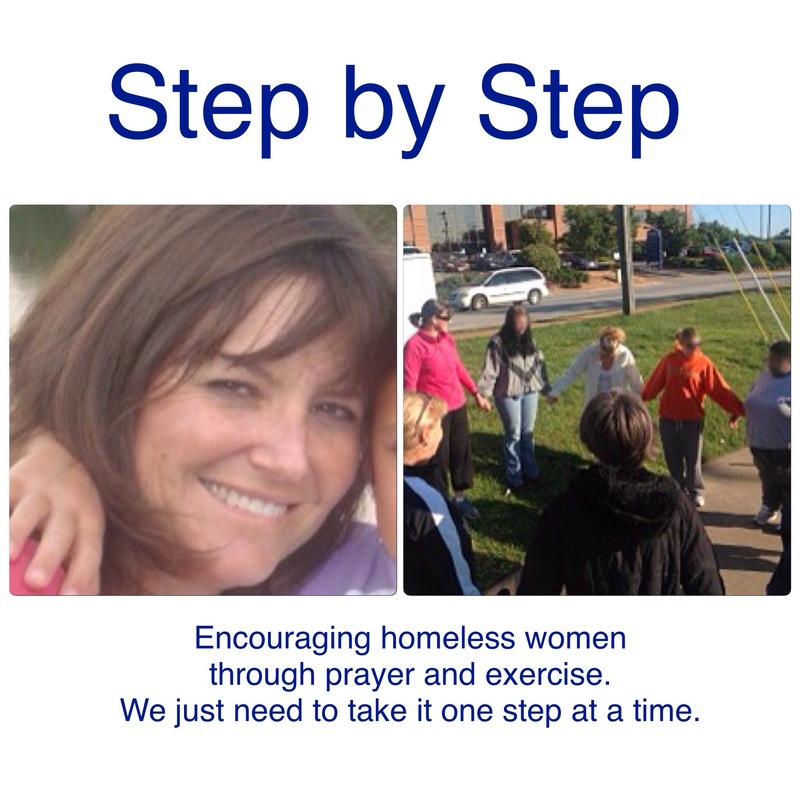 She has seen women be transformed physically﻿, mentally and spiritually with her program. I’m so proud of what she is doing. Posted on April 28, 2016 by mary •	This entry was posted in Crafts and tagged craft fair, missions, sewing, volunteering. Bookmark the permalink.